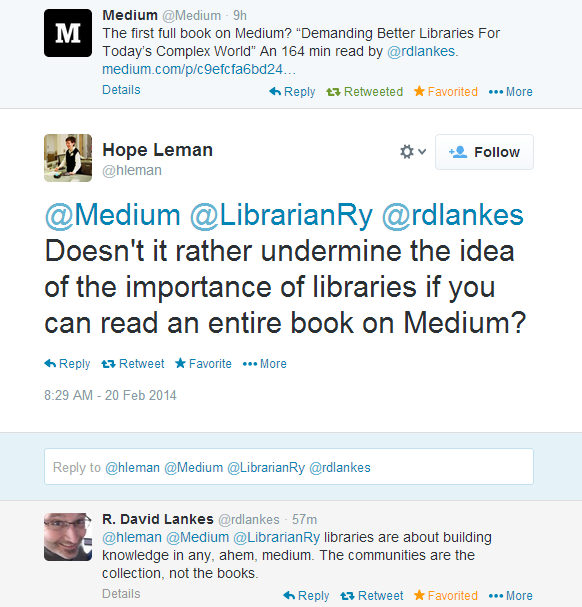 Interested in reading David Lankes great book “Demanding Better Libraries For Today’s Complex World”??? Well now you can, for free, over at the excellent site Medium. I think this is huge. Why? Medium is something I can see becoming a very big tool on the internet for sharing information. 1. I’ve been dabbling with Medium for some time. To me, it feels like the next step in the evolution of blogging/writing online. 2. I’ve never really been clear on what Medium can be. Is it a site for blog like writing? It is a site for simple sharing? Is it a site for long form publishing? David releasing his ENTIRE book on Medium shows me that Medium is ANYTHING that we want it to be. 3. It has amazing design. Articles published on Medium look beautiful and are easy to read. The interface for the writer (statistics, collections, etc) are easy to manage and great to browse. Once again, David Lankes has put himself out ahead of the curve in the library world and released a full (and amazing) book on Medium. This isn’t one of those “this could be big” moments. This is one of those “THIS IS BIG” moments. I am a huge fan of Medium. I helped support it through Kickstarter as it seemed such an interesting idea I have been enjoying the reading it has been providing – a very interesting range of investigative work. Plus they highlight other interesting reading as well. I had already bought this title as an ebook, so would have preferred it being released earlier so I did not buy it (and I only bought it because not accessible via library). That is just being a bit picky. Interesting! I like how readers can leave comments throughout the book, similar to the companion site Lankes set up for the Atlas of New Librarianship (but easier!). I’m wondering about bookmarking though – when reading long-form in multiple sittings, how do you know where you left off?